Following John Loyer's head coaching debut, expectations were high. Not only did the Pistons knock off a Western Conference powerhouse, they did so in convincing fashion, led by the schematic overhaul of Loyer's schemes. His second outing--against the Cavaliers--was less promising. Loyer allowed the team to freelance more, choosing not to call the offense as rigidly as he did against the Spurs. This ended predictably: the offense inevitably hit a wall and the team ran into the same problems it has grappled with all season, namely stagnating movement, contested two pointers, and a lack of open looks. Even in the less structured offense, there were moments of brightness. This season, Brandon Jennings ranks fourth in the league in time of possession. 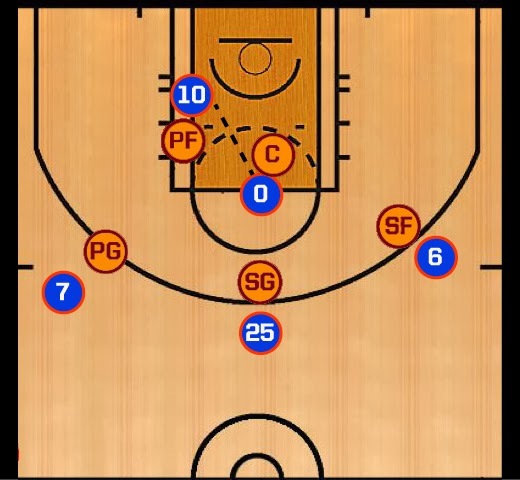 One of the reasons is because of the difficulty the team has had entering the ball into the offensive post, resulting in a lot of standing around while Jennings fakes passes to (usually) Greg Monroe. The Pistons were no better against the Cavs in this regard, but they did show a motion that remedied the problem. This particular instance happened early in the third quarter. 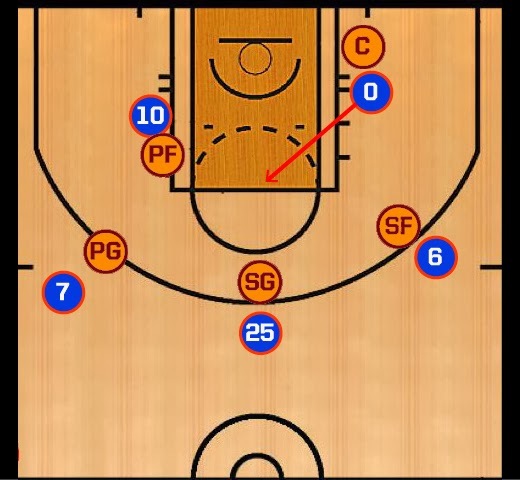 After some superficial movement, the Pistons are aligned in an umbrella formation with Josh Smith, Kyle Singler, and Jennings at the top of the key. Jennings has the ball and is trying to get it into the post to Monroe. Drummond is stationed on the weakside of the basket per usual. With Monroe being fronted and Jennings struggling to enter the ball, Drummond makes a quick cut to the foul line. When Drummond gets to the stripe, Jennings immediately passes him the ball. As the pass is entered into the high post, Monroe spins off of his defender and makes a back cut to the basket. Monroe beats his defender and Drummond dumps a pass inside to Monroe for an easy bucket. That's how the play is supposed to work and how it had once or twice previous. In this instance, Monroe didn't cut hard enough and Drummond had to hold the ball for an extra beat before passing over the top. The play ended with a shooting foul that sent Monroe to the free throw line. The Pistons ran this set a few different times in the game, but I didn't think to make a note of it until I saw it again in the third quarter. Drummond has spent most of his NBA career on the weakside of the basket lurking for offensive rebounds and putbacks, but this is one of the first times we've seen a coach utilize his presence there as a schematic advantage. 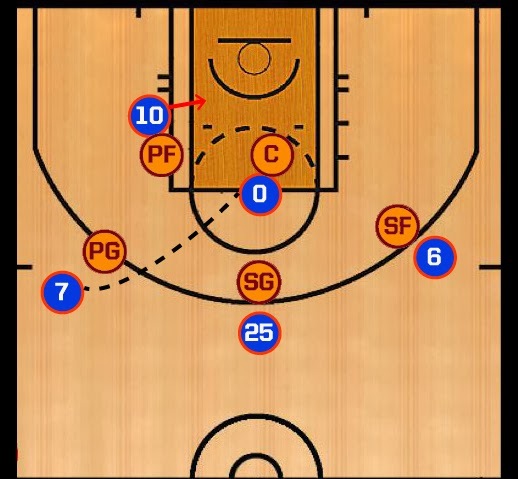 Loyer--and even Cheeks this season--starts most offensive sets with shooters in the corners, but their absence on this play (specifically Singler's off-ball movement to the top of the arch) indicates that this is exactly how the play is drawn up: if Jennings struggles to enter the ball into the post, Drummond needs to recognize this and cut to the foul line. In spite of the stagnating offense and Loyer's resistance to calling set plays against the Cavs, his integration of these more fluid plays into his scheme shows foresight and an understanding of both the roster and the players' strongest assets. The Pistons may have stumbled into the All-Star break, but the future is still bright with Loyer at the helm.